The Indigenous People of Biafra (IPOB) can confirm that the British Government is working in tandem with Retired Major General Muhammadu Buhari to stealthily administer a non-traceable poison on the leader of IPOB, Mazi Nnamdi Kanu. Our intelligence gathering team revealed that one of the reasons for embarking on this heinous crime by both the British Government and the serial killer called Buhari is to stop the avalanche of leaked videos and some classified information which incontrovertibly placed the British Government as an accessory to genocide on Biafrans. Another reason is to ensure that Nnamdi Kanu is dead before Mr. Donald J. Trump takes over as the 45th President of the USA. We have also confirmed that should the plan to poison Nnamdi Kanu fail, a phantom road accident will be arranged for the vehicle conveying Nnamdi Kanu to court on any of the court days beginning from Tuesday, 10th of January 2017. What bothers us in IPOB is the fact that Biafrans are Christians and a sizeable proportion of whom are Anglican denomination including the parents of Mazi Nnamdi Kanu, which was where they baptized and christened him “Kenneth“ or “Kenny“ for short. So, as a child and in accordance with Anglican prayer book, NnamdiKanu grew up praying for the safety and well-being of Queen Elizabeth II, Prince Charles and all their heirs. But the question we ask the British Government is this; Why would Britain, a supposedly Christian country and a proclaimed member of the body of Christ, be supporting people of Islamic faith such as Buhari to kill Biafrans and enthrone servitude in Biafraland? From where is this British Government hatred on fellow Christians of Biafran descent coming? Perhaps, the British Government must tell the world what we, Biafrans, did to them that makes them hate us so much. Is it because we accepted Christianity that they see us as inferior beings or is it the fact that we have English names that made them see us as people without a proud identity? Even the undersigned of this press release still bear their English names and append same on all documents both personal and corporate. 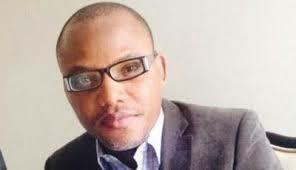 Why would the British Government want Nnamdi Kanu dead in spite of the fact that he is a British citizen? Or is it in line with the British Government’s standard practice of hating every African freedom fighter? Recall that both Margaret Thatcher and David Cameron called Nelson Mandela a terrorist and demanded he should be hanged. In like manner, the British Government is now pushing for Nnamdi Kanu to be jailed by Buhari’s sister and incompetent Judge, Mrs. Binta Nyako. This hatred for African freedom fighters, especially those of the Christian faith, by the British Government is very surprising considering that these are Africans who willingly accepted Christianity. What is it in Islam that the British Government discovered which makes them abandon their fellow Christians and connive with Muslims to oppress and kill these Christians on a continual basis? We would like to use this opportunity to caution the British Government to retrace their steps and terminate their plans to kill Mazi Nnamdi Kanu. We are also putting the world on notice that should anything happen to Nnamdi Kanu or those detained with him and elsewhere in Nigeria, the British Government shall be held directly responsible for their deaths. We reassure the world that the restoration of the nation of Biafra is a divine project whose time has come. Both Muhammadu Buhari and the Biafra-hating British Government are incapable of stopping the restoration of the nation of Biafra and 2017 is the year that kick-starts the restoration process. To stop the restoration of the nation of Biafra, the British Government will have to kill over 70 million Biafrans who have sworn to restore their God-given nation. We reiterate that the sovereignty of the nation of Biafra is not negotiable, come rain or shine!! !